Today I played around with run­ning dif­fer­ent sounds through AriesVerb (as I often do). I was sur­prised how strong the mod­u­la­tion already is in the default pro­gram “Tem­ple of the Ances­tors”. I played a—cough—free inter­pre­ta­tion of the Pas­toral sonata through AriesVerb. 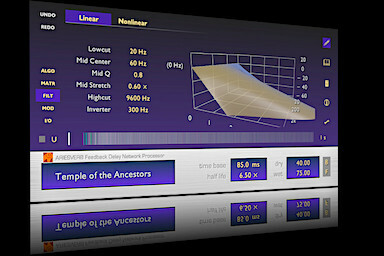 Anoth­er notable sound I found func­tions like a tor­ture test for algo­rith­mic reverbs. It’s a machine gun! This sound can expose many a weak­ness, and make reverbs fail that sound flaw­less oth­er­wise. I designed a for­est-like envi­ron­ment for exact­ly this to sound good. This pre­set will be avail­able in the next update, as it makes use of some new algo­rith­mic fea­tures.